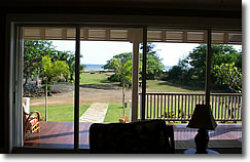 The beautifully crafted Hale Ohana Kauai vacation rental boasts ocean views from almost every room in the house. Retractible sliding glass doors open to the spacious main and upper floor lanais providing for an indoor/outdoor feeling while enjoying the comfort of the lavishly appointed living area with tropically covered solid Teak furnishings. 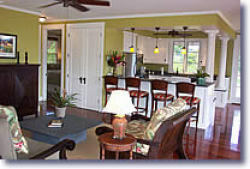 Hale Ohana features a large and fully equipped kitchen. You'll enjoy preparing meals and entertaining with top-of-the-line appliances and all of the finest kitchen amenities. 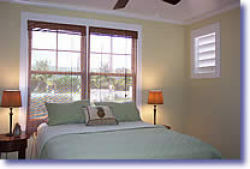 Each room is equipped with a ceiling fan and plenty of ventilating windows to keep the interior comfortable and cool. 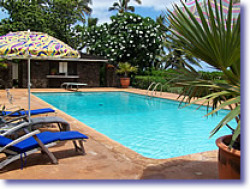 The main floor of the Hale Ohana Kauai vacation rental has two guest bedrooms and two full bathrooms. The bathroom floors and showers are made of Travertine and the counters throughout the home are Soapstone. The bedrooms are tastefully decorated to recreate the authentic Hawaiian style. The custom-built, raised beds feature pull out drawers and each room has a ceiling fan and windows to allow for natural circulation of the cool Hawaiian tradewinds. The floors througout Hale Ohana are adorned in natural fiber Sea Grass coverings. Balance to be paid - 6 weeks before to arrival.